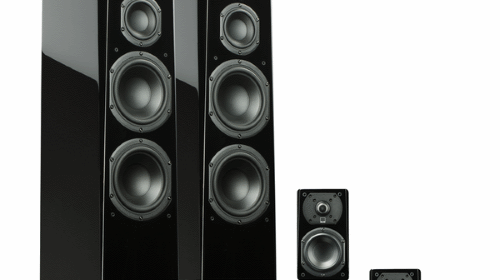 SVS is best known for subwoofers that provide outstanding value for money, but today we are going to look at, er… listen to their $1550/£1300 Prime Tower Surround home theater speaker package. Two Prime Towers ($1000/£819), two Prime Satellites ($270/£219), and one Prime Center ($350/£289) are included in the kit. This shaves around $120/£27 off the à la carte price. A few steps closer to a bargain and puts it off to a good start. But, none of that will matter if the kit does not sound and look, the way a mid-range speaker kit should. Let’s dig in. SVS did an outstanding job of isolating the large and heavy Prime speakers. And they needed to, as a single Tower weighs in at a touch over 40lb. While the others are not quite as big or heavy, each received the right amount of TLC ensuring that everything arrived safely. I love piano black finish. It just looks fantastic, and SVS did an outstanding job with the gloss on the Prime speakers. Beautiful, but unfortunately a bit tricky to photograph as it is very, very reflective. Coupled with the obvious attention to detail and very handsome design, they all fit perfectly into my home theater setup; from an aesthetic perspective, anyway J. It is easy to discount how massive the 7.6″x18.6″x8.6″ Prime Center actually is in photographs. And as you can see in the gallery, I had to cobble together a temporary solution to raise the TV up ~4″. To be clear, I do not consider this to be a blocking issue, just something that requires awareness and planning (which I obviously failed to do). The trade-off with the size is that unlike most center channel speakers, the Prime Center includes 2x 5.25″ woofers alongside a 1″ tweeter and 3.5″ midrange driver. With four discrete drivers covering the high, mid, and low end, the Prime Center will be able to run a lower crossover and push more of the audio directionally toward the sweet spot. The Prime Satellite and Prime Tower share the same 1″ tweeter and 4.5″ midrange driver, with the floor standing model adding two 6.5″ woofers as well. 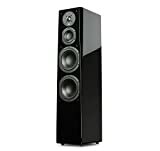 All of the Prime speakers include rear-firing ports as well, to create a deeper bass note. Rounding out the package, each of speakers include inset 5-way binding posts and were tested with standard banana plugs and stripped speaker wire. The Prime Tower features differing high-quality replaceable leveling screws, but some cost corners appear to be cut with the Prime Center and Satellite with small rubber “feet” included. While I did not mind a little DIY during installation, especially with the Prime Satellites as they could easily end up on a stand or hung on the wall (via the attached mounts), I would have preferred to see something a little more upscale for the Prime Center. That said, the nubs did do an excellent job with isolation, so perhaps more “white whine” than legitimate concern. The first step after installation was running through Audyssey MultEQ XT room setup where the Prime Towers were, unsurprisingly, detected as “Large” speakers. 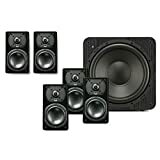 Generally, this is not recommended because it causes the Audyssey filters to not redirect any bass from the tower to the subwoofer when performing room correction, allowing the speaker to specialize by not being driven as hard. What was surprising, is that the Prime Tower actually sounds richer, fuller, and more balanced in the “Large” configuration for both music and movies. While testing this, after setting the Prime Towers to “Small”, it quickly became obvious that they are begging to be driven directly – especially for music, which is where I think the Prime Towers really shine. Not only do they present outstanding center imaging and an unwillingness to compromise either punch or clarity, they also subtly seduce listeners to keep turning up the volume. With each notch on the dial even sweeter than the last, the only limits I found were with my ears and marital tolerance; mostly the latter. I love music, so it was fantastic to experience how well rounded the Prime Towers were with all the genres tested; rock, jazz, folk, EDM, metal, hip-hop. Everything from the hard hitting bass in “Sail” (AWOLNATION), to the mid-range percussive clarity in “Too Close” (Alex Clare), chill-enticing “No More I Loves You’s” (Annie Lennox), to Billie Holiday’s smooth warble in “Come Rain or Come Shine”, and frantic energy in “Free the Animal” (Sia) was easily handled. Drawing the listener into an enveloping sonic cocoon. Potential buyers beware: expect to lose several hours within the first few weeks of ownership replaying all your favorite tracks. The Prime Tower’s performance was not entirely unexpected, but I was quite pleasantly surprised by the Prime Satellite’s musical abilities – albeit in a much smaller room. Along with the main home theater audio video receiver (AVR), I also keep one in my 7’x9’ office, strictly for music. Unfortunately, there is not space for towers in this room so I thought it only fitting to do some additional testing with the smaller surrounds. Like their larger siblings, the Prime Satellites handle the high and mid-range quite well, but due to the size obviously have to give up significant ground on the low-end. Although, not nearly as much as I expected. 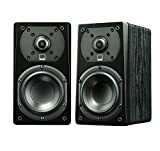 They easily outclass the similarly sized and priced bookshelf speakers that are normally used. There is not much for a center channel to do when it comes to music, so the Prime Center was not tested for that capability specifically. But, it did get quite the workout when it came to video content. To digress briefly, I think it is fantastic that SVS has clearly paid the attention that they did to producing a focused center channel. For the vast majority of non-music content, the center is the most important speaker. Almost all dialog goes through it, even most “stereo” TV content is up-mixed by AVR across the front three speakers, with the majority sent through the center. It should not be treated as an afterthought, and SVS obviously has not. The Prime Center is clear and crisp, and just like the Prime Tower, able to handle everything that was asked of it. Blending seamlessly into the front stage provided it was set to “Small” in the AVR settings which allows the mains and sub to take on some of the low end burden. Not much redirection is needed though, with Audyssey’s room detection system setting the cross-over at 40Hz. I expected this to be too low, as 80Hz is generally the recommendation even for larger “Small” speakers, but after playing around with it a bit, I found that, at least for my lounge, it was suitable. There were clear differences at 40/60/80Hz, but nowhere along the way did it sound like the Prime Center was overtaxed, so I eventually settled back at 40Hz, preferring the tonal quality in that configuration. Despite my poor planning, if I had to pick one speaker from the bunch, it would be the Prime Center, because it made the biggest performance difference from my usual setup. After extensive testing with movies, TV, and music, it is easy to hear that the SVS Prime Tower Surround kit is a fantastic mid-range solution for well-rounded home theater use. It delivers brilliantly on the audio side, as well as in the optics department. The only “criticism” is that you will need to plan around the size of the Prime Center (well worth it though). 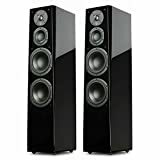 I cannot claim that they are the best sounding speakers that I have ever listened to, but they are far and away the best performing, and looking system at this price point, and likely even twice the amount. 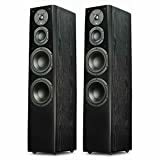 As good as I found the SVS Prime Tower Surround kit to be, I need to point out that you do not have to take my, or any other reviewer’s word for it. You can have the same experience that we did. Try out any SVS speaker or subwoofer for 45 days. Run through your favorite movies and music. Hear how good they sound, and see how good they look in your viewing room. This is part of the SVS “Bill of Rights” which also includes a one year “no lemon”, one year trade-up, and one year performance guarantees. Along with quite a few other valuable perks, if you live in the US. The story is a bit murkier for UK buyers, because SVS does not sell directly here. So there is no clear “Bill of Rights” (it is up to the dealer) and less aggressive pricing due to VAT. But that takes nothing away from what is clearly an outstanding product. All told, the Prime Tower Surround home theater kit does exactly what it is marketed and sold to do. Enhance the home theater experience by creating an immersive, high quality, sound stage. Well done SVS. Thanks to SVS for providing the review samples.